That skirt is absolutely beautiful with the jean shirt! It's really perfect and I love it! Love this skirt!! You look gorgeous. Have a wonderful weekend! Love the color of this skirt. Looks great with the shirt. I really like this, I think orange and blue go together perfectly. I really like the dark wash of this short sleeve chambray too! That is a fabulous skirt and paired with the chambray is perfect. I love everything about this look! 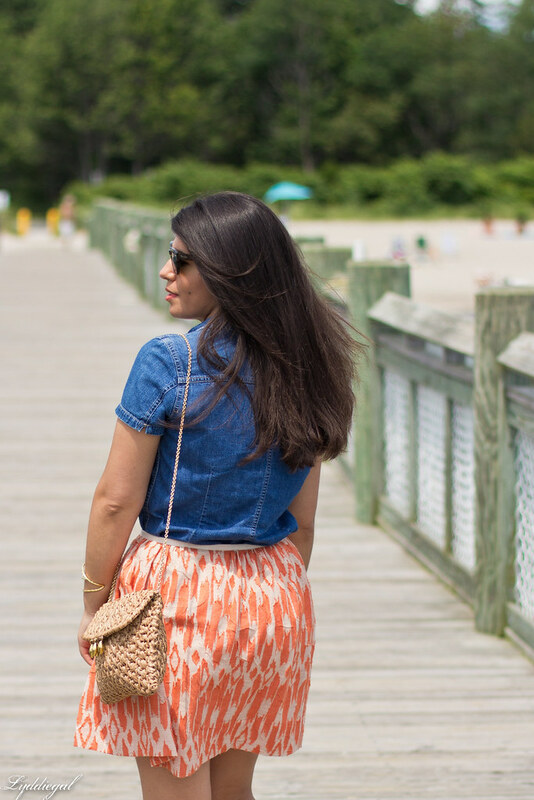 That bright skirt is perfect and chambray is always my go to top! You look fab! I like it - you can also wear it with a tank top and a summer scarf… Oh and in case i have not said it before, I am a fan of your straw clutch. I wouldn't normally have thought that a dark chambray would work with that skirt but you've totally proven me wrong - it looks really cute! I love when that happens! This is a great pairing for sure. Maybe mint would be nice with it also? I'm sure you will figure out a lot of other ways to remix this cute skirt! That may be my favorite skirt on you and not because it's orange.Enjoy your weekend! I love this with chambray. Really, isn't it the best when you find a Pinterest inspiration pic and realize you can recreate it with what you already own? That pattern is awesome!! Love it paired with the chambray--getting inspired from Pinterest is the best! I love this combo! I have the dress version of this skirt, but I'm wishing I had the skirt since it's much more versatile! Ikat is one of my favorite prints! 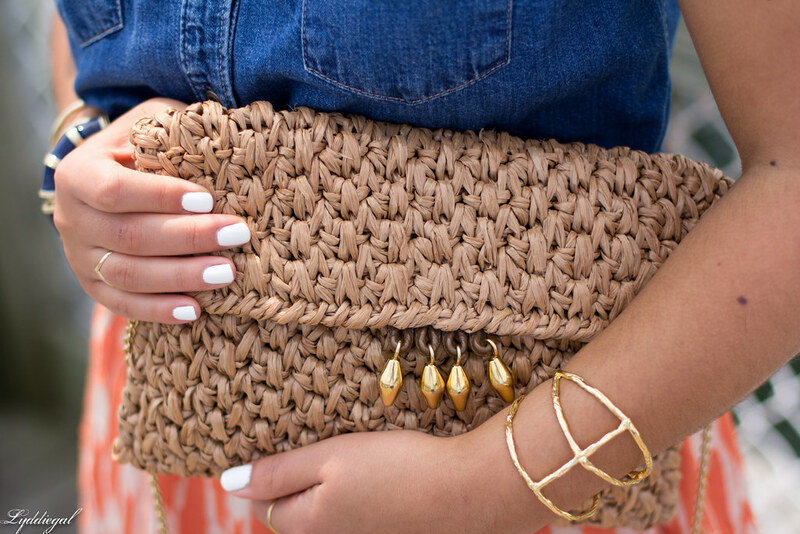 Love it paired with the chambray and that bag is gorgeous! That skirt has summer written all over it! Such a perfect print and color! 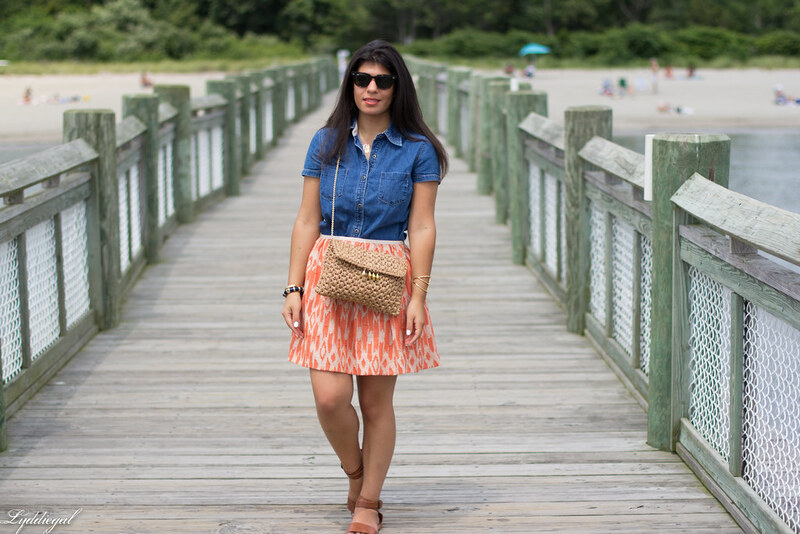 That gorgeous pattern skirt looks so cute paired with chambray. Pinteres is such a great place for inspiration. 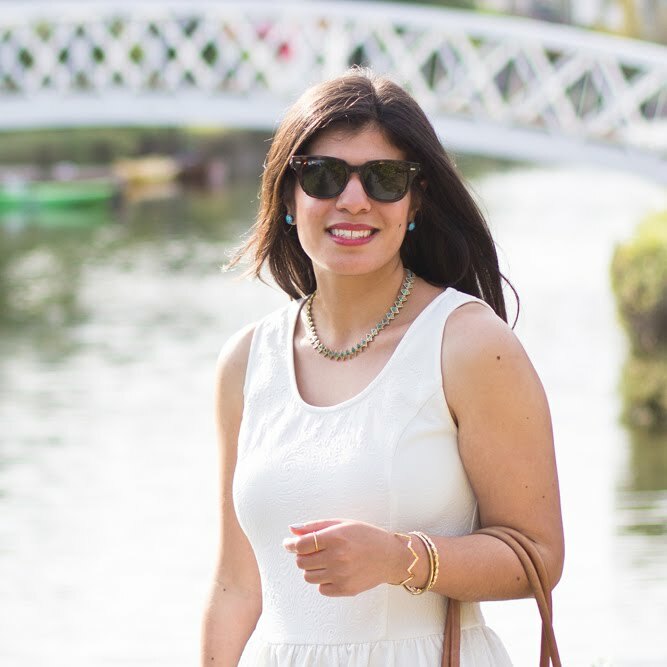 You created charming Summer look. Isn't it funny how sometimes the only push you need to start rewearing neglected clothes is a little pinspiration? As much as I've personally loved your cream only period, I do adore this skirt and the chambray pairing is, without a doubt ingenius. Plus, anyone who can successfully wear orange always deserves praise in my book. It is not an easy colour and you pull it off beautifully. Ooh yes, I think this combo is a winner! 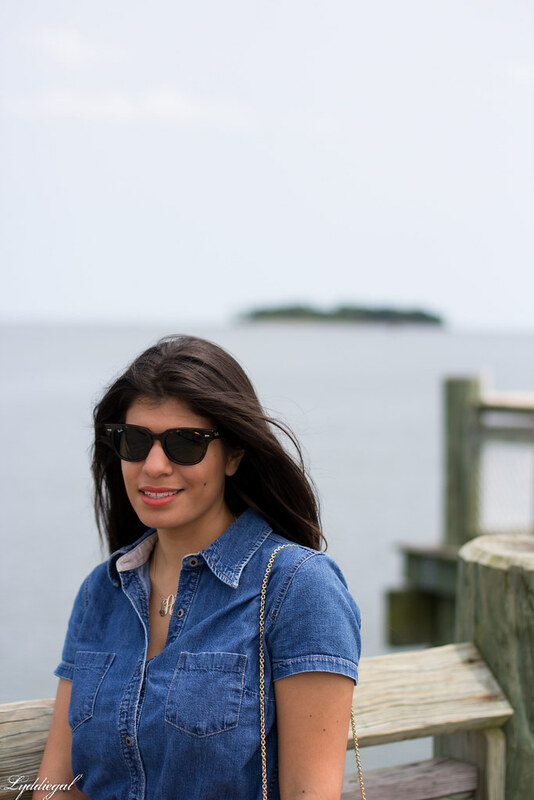 I love chambray anything, and the blue complements the orange perfectly! Perfect late summer attire. Love the happy skirt with the darker chambray. Denim with coral is a gorgeous combination! Very pretty skirt! I love chambray with it. That bag is gorgeous Lydia. Great look from head to toe. Oooh I love this skirt! The orange is so pretty. I'm glad you decided to break it out. And it looks great with the chambray! And your hair looks very model-esque here, Lyddie. I mean, it always does, but whenever I see it from behind I think "dang!" That skirt is so pretty and this color suits you so well. That chambray top is PERFECT with that skirt. You hit the nail on the head with this outfit. 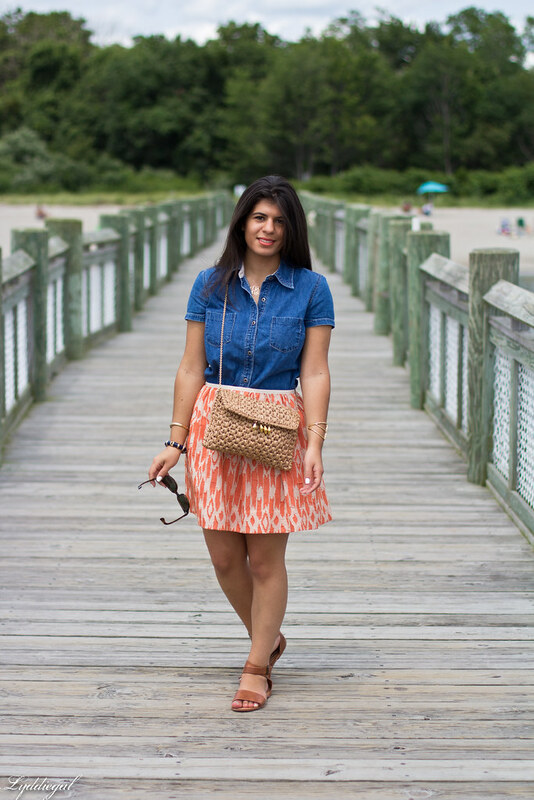 The chambray top is perfect pairing for the patterned skirt. Thanks for sharing! I am definitely going to try it out as it looks like it stays on forever throughout the day. Absolutely fantastic look! Love the way you are starting to transition into a fall colour palette with this great ikat print! You look like a picture straight out of Pinterest! Love your outfit! The coral color is so pretty on you and great photos too! 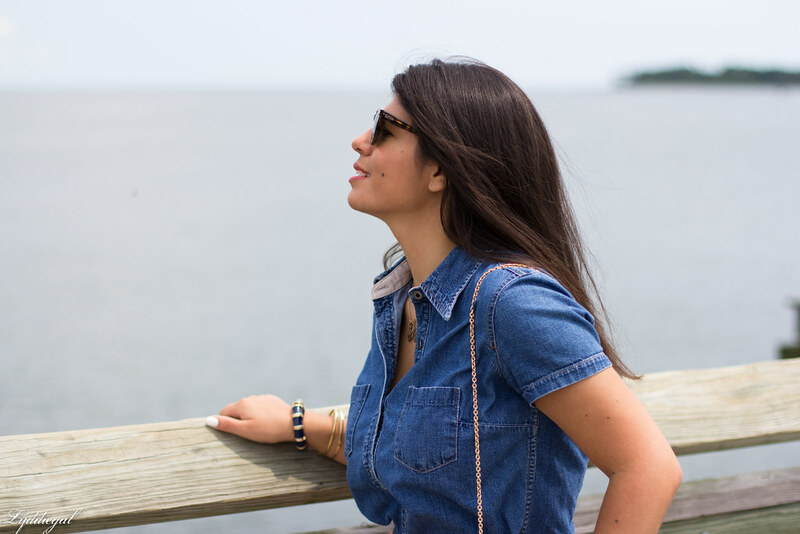 Chambray is such a great alternative for summer separates. I love the colour combination. Stunning outfit! You look gorgeous. LOVE LOVE LOVE the Ikat print and color of your skirt! It looks amazing paired with your chambray!